Our very unique and exclusive ?Hamsa? design is a rare find when it comes to Jewish t-shirts! 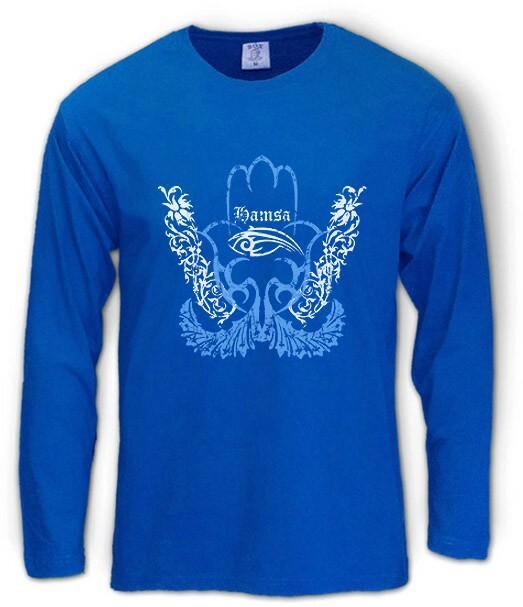 With the word Hamsa meaning ?five?, the Hamsa is symbolic in both Islamic and Jewish faiths. Known by many names, it's ?power? is in protecting the bearer of the design against the evil eye and other possible ill causing events. Jews will recognize the name Hand of God or Hand of Miriam, the sister of Moses and Aaron. With our Hebrew t-shirt graphic in light blue and white, this design is sure to become a vintage classic! Our t-shirts are made of 100% cotton and are long lasting with bright colors. Our products are all designed and printed in Israel.